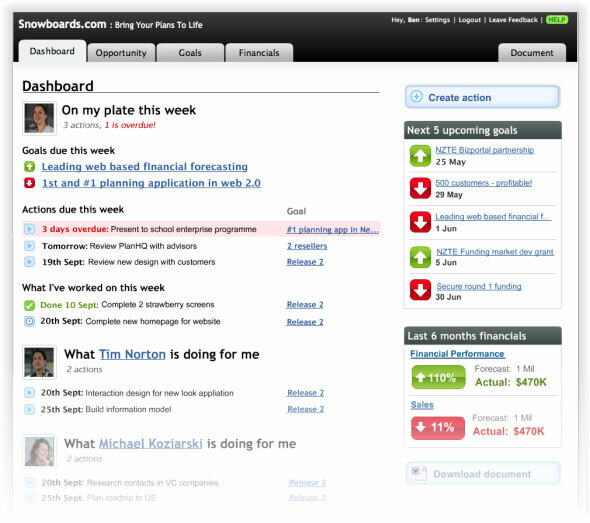 PlanHQ, a Wellington, New Zealand startup that launched in April 2007, has just 180 paying customers and $6,000/month in revenue. But their product, which allows companies to create and track business plan and other goals and objectives, is getting rave reviews from some well known venture capitalists. That’s good news for the tiny startup. The product is an easy to use business plan builder and project manager – set up goals and projections (financial, product or customer related) and then track those goals with the software. 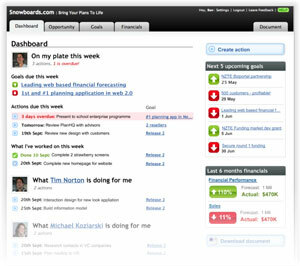 It’s not free – PlanHQ costs between $9 and $45 per month. Half their customers are choosing the high end plan. It’s proving to be a useful tool for keeping the executive teams of startups focused on their primary goals (the ones the stockholders and board of directors care about) by providing constant feedback on the status of those goals. The funny thing is, CEOs may not be the best people to market the product to. Sometimes more transparency into how they and their teams are doing is the last thing they want. But PlanHQ is hoping that venture capitalists will push it on companies. First Round Capital, a very well known early stage venture fund, is testing PlanHQ (they are not an investor). Other VCs are testing it as well, says company founder Tim Norton. For VCs, it provides a single interface for monitoring all of their investments and holding companies to their projections. PlanHQ is evolving to serve VCs more fully by launching a board member reporting feature on Wednesday. The company is also working on having the product integrate seamlessly with well known accounting software to import financial data. The company has raised just $250,000 in capital from angel investors and has six employees. To the extent they can get VCs to make this mandatory for their portfolio companies, Norton may find himself running a profitable, if niche, business.